Our Corporate Management Committee, a group comprised of Canadian Natural’s senior executives who share the responsibilities normally associated with a Chief Executive Officer position, approves the Stewardship Report to Stakeholders as delegated by the Board of Directors. Three members of the Management Committee are also directors of the Company — the Executive Chair, Executive Vice-Chair and the President. Senior Management supports our teams by ensuring adequate resources are in place to implement programs, maintain documentation and conduct training. Training is essential to ensure knowledge on critical procedures for Canadian Natural’s staff at all levels. Our teams work together with management and all operating areas to ensure safety, asset integrity and environmental stewardship are factored into our decision-making process. Our governance structure, including our Board, Management Committee and Operations Committees, is supported by policies and controls (including performance standards) that influence our decisions at every level of the Company. Canadian Natural's Health, Safety and Environmental Committee (HSE) of the Board of Directors meets every quarter to discuss stewardship matters. The Directors in the HSE Committee oversee and monitor the company-wide efforts to support, manage and improve our performance, and ensure the effectiveness of health, safety, asset integrity, environmental risk and social programs. The HSE Committee also reviews internal stewardship reports about objectives, performance and key performance indicators. The Health and Safety, Asset Integrity, Environment, Stakeholder Relations and Community Investment groups report on a regular basis to Senior Management, who in turn provide updates to the HSE Committee. Canadian Natural’s Board of Directors brings a mix of experience, knowledge and understanding gained through senior level positions held in the public and private sectors. Our directors bring expertise from a range of sectors, such as oil and natural gas, energy storage solutions, technology, legal, finance, health, and retail, where leadership and governance over corporate social responsibility matters have been a longstanding priority. Specifically, two directors have relevant experience in the area of climate change, and eight directors have relevant experience in the areas of health, safety and environment. 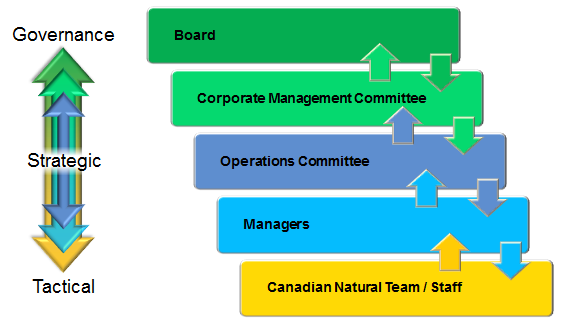 Canadian Natural’s Board Committees are described in detail in the 2017 Management Information Circular, including the Board’s expertise and experience in the Schedule A. Governance policies are available on this page. Aspects of climate change risk that most influence the Company’s business strategy are: future compliance costs/regulatory changes, access to markets, and reputational risk. Canadian Natural provides ongoing reporting on how we are addressing climate and other environmental related financial risks. Management Committee is responsible for the identification, assessment and management of climate change risks. Management Committee and the Greenhouse Gas (GHG) Operations Strategy Committee provide direction and guidance to business units on climate-related risk assessment and project implementation. GHG Operations Strategy Committee is responsible for climate change strategy and issue prioritization, as well as overseeing our working groups that manage and coordinate GHG reduction and technology projects across the Company. This committee also assesses and provides input on current and developing GHG policy and regulation. Nominating, Governance and Risk Committee of the Board reviews the status of risk monitoring activities, including climate-related regulatory and operational risks, and the steps Management has taken to implement mitigating actions. Health, Safety, Asset Integrity and Environmental Committee of the Board is responsible for ensuring that Management has effective design and implementation of environmental risk programs, controls and reporting systems. Board of Directors is responsible for overseeing and ensuring that the Management Committee has appropriate and effective measures in place to manage climate-related risk. Climate risk management also occurs at the asset level through recurring project and technology reviews, as well as economic evaluations, including forecasting GHG intensity and compliance costs, and reviewing abatement projects. Internal quarterly management reviews are completed to monitor GHG emissions performance. As per regulatory requirements for specific facilities and/or jurisdictions where we operate, GHG emissions reports are submitted annually. As the world transitions to better, lower carbon ways of producing and consuming crude oil and natural gas, Canadian Natural’s large, diversified and balanced portfolio is well-positioned to be resilient in a lower carbon economy. With a portfolio that consists of long life low decline assets, representing a reserve life of 50 years, we will continue to create long-term value and opportunities to drive lower GHG emissions through continuous improvement and investments in technology. Canadian Natural reviews external scenario analyses of climate change from energy firms/agencies, and on that basis has developed two internal scenarios in order to assess business risk. Across the range of ambitious climate change scenarios, the expectation is that there will be substantial global production and consumption of crude oil and natural gas for decades to come. As result of Canadian Natural’s GHG management strategy, our reserves face limited risk even under more ambitious climate change scenarios. Further details on environmental risks, GHG emissions management strategies and climate change policies and regulations can be found in our Annual Information Form and Management Information Circular, as well as in our 2017 CDP Climate Change Submission.